Date is exactly "1914 September 15"
Margaret lets Jessie know that she won’t be able to visit because of their cousin’s nervous breakdown. 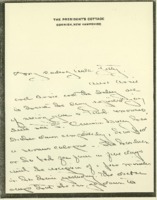 William P. Malburn writes Benjamin Strong Jr. regarding the transfer of $200,000 in gold to Ottawa. 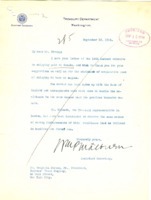 William G. McAdoo writes Benjamin Strong Jr. regarding the transfer of $200,000 in gold to Ottawa.